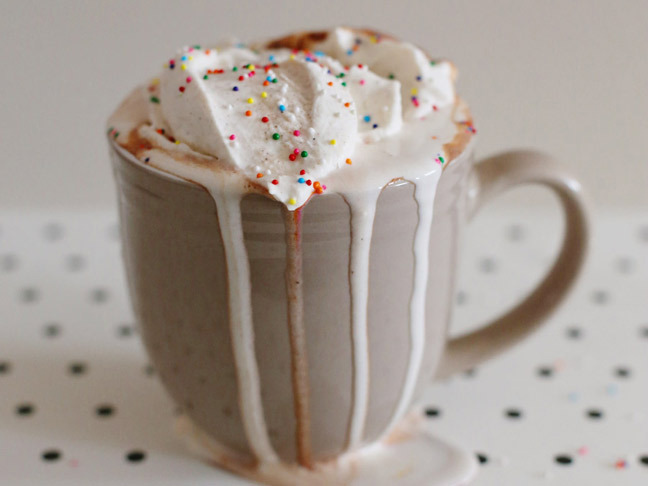 Hands down the most favored cool-weather treat around our house is hot chocolate! Tossing those little packets to the side, I recently started making hot chocolate from scratch using Nutella. It’s so easy to make. This Nutella hot chocolate with cinnamon whipped cream is an amazingly delicious treat that is a hit with kids young and old. Step 1: Over medium heat, warm milk in a saucepan until simmering. Do not boil. Step 2: When warmed through, add Nutella and whisk to combine. Continue heating, whisking occasionally, until steamy and frothy. Step 3: In a large mixing bowl, combine heavy cream, vanilla, sugar, and ground cinnamon. Use a mixer on high speed to whip until soft peaks form. Step 4: Pour the hot chooclate into your favorite mug. Top with a generous dollup or two of whipped cream. Add sprinkles, chocolate shavings, or other garnishes if desired.